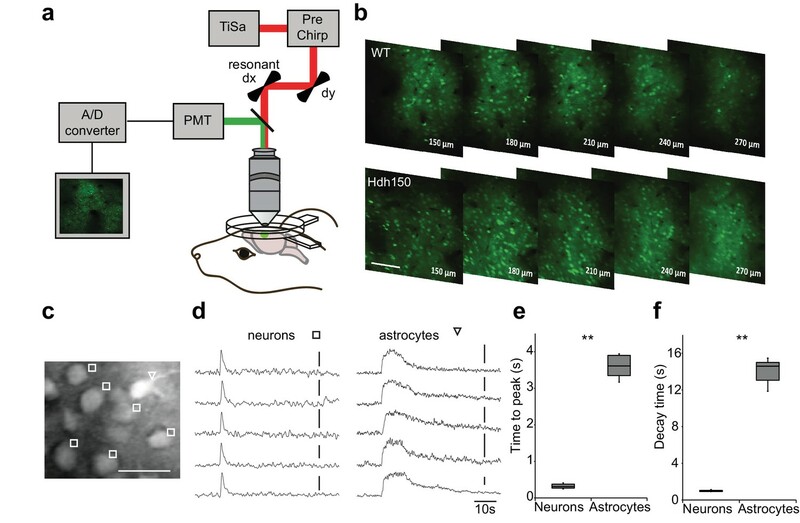 In vivo two-photon Ca2+ imaging in layer 2/3 of visual cortex reveals a hyperactive neuronal activity pattern prior to disease onset. (a,b) Top right, Illustrations indicating the visual cortex (blue area) in human (a) and mouse (b) brains. The brains are not drawn to scale. Bottom, timeline of Huntington’s disease progression in human and Hdh150 mouse model of Huntington’s disease. The Huntington’s disease onset was age 30–50 years in humans and ~70 weeks in Hdh150 mice. We conducted our experiments during a very early pre-symptomatic phase, far prior to mHtt aggregates and motor symptoms. VFDO: very far from disease onset. (c) Representative two-photon images of OGB-1 AM staining in layer 2/3 of the visual cortex of WT and Hdh150 mice. Scale bar: 70 µm. (d) Color-coded maps of silent (black) and spontaneously active (orange) neurons in WT (left) and Hdh150 (right) mice. Dashed lines represent the boundaries of blood vessels (original images in Figure 1c). Scale bar: 100 µm. 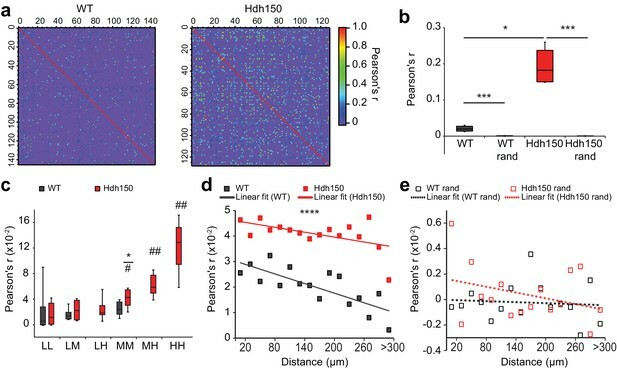 (e) Density of stained cells in layer 2/3 of the visual cortex in WT and Hdh150 mice. Unpaired t-test, p=0.71. (f) Increased proportion of spontaneously active neurons in Hdh150 mice. Unpaired t-test, p<0.05. (g) Representative traces of spontaneous Ca2+ transients (red) of 10 neurons recorded in vivo in WT and Hdh150 mice. Vertical scale bars: 40% dF/F. 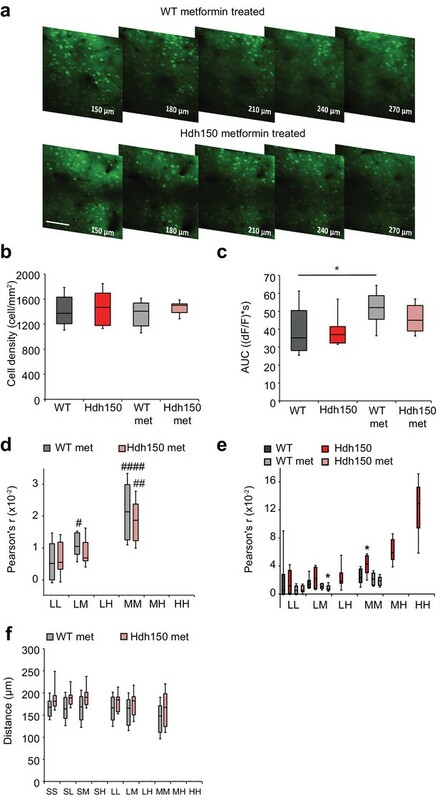 (h) Increased frequency of Ca2+ transients in spontaneously active neurons of Hdh150 mice. Silent neurons were excluded, as in subsequent panels. Mann-Whitney test, p<0.01 (i) Quantification of area under the curve (AUC) of Ca2+ transients. Unpaired t-test, p=0.98 (j) Cumulative frequency distribution of Ca2+ transients in WT (dark grey) and Hdh150 (red) mice. Top, colored categorization of neurons according to their Ca2+ transient frequencies. Two-way ANOVA, group: p<0.0001, time: p<0.0001, Interaction: p<0.0001. (k) Color-coded categorization of neurons according to their Ca2+ transient frequency: ‘low’ (<0.3 trans/min, blue; silent neurons excluded), ‘medium’ (0.3–3 trans/min, orange) and ‘hyper’ (>3 trans/min, red). Each peak is marked by an asterisk. (l) Relative proportion of low, medium and hyperactive neurons in layer 2/3 of the visual cortex in WT (left) and Hdh150 (right) mice. Chi-square test, p<0.01. Numerical values of Figure 1 and associated supplement figures. Code used for the analysis of calcium imaging. Ca2+ events from astrocytes and neurons show clearly distinct kinetics. (a) Schematic diagram of the two-photon microscope used for high-speed Ca2+ imaging in vivo. The synthetic dye OGB-1 AM loaded in layer 2/3 of mouse visual cortex was excited by pulsed laser light generated by a Ti:sapphire laser (λ = 800 nm), a resonant scanner enabled video-rate imaging. Emitted light was collected by a photomultiplier tube (PMT). 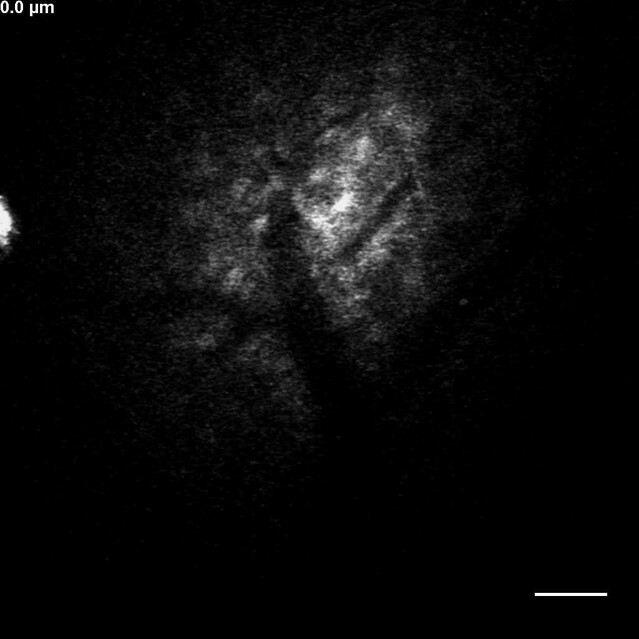 (b) Two-photon images of OGB-1 AM staining captured in vivo at depths between 150 and 270 µm from the pial surface in the visual cortex of WT (top) and Hdh150 (bottom) mice. Scale bar: 70 µm. 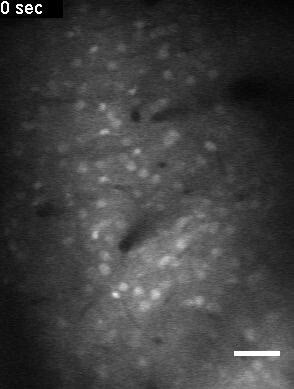 (c) Two-photon image of OGB-1 AM staining in layer 2/3 of the visual cortex. Neurons (open squares) show round shapes with no processes. Astrocytes (inverted open triangle) in contrast, are more intensely stained; both the soma and processes can be visualized. Scale bar: 40 µm. (d) Five representative traces recorded for visually identified neurons (left) and astrocytes (right). Putative astrocytes show slower rise time, longer duration, and slower decay. The onset of events is aligned. Scale bars: 40% dF/F. (e, f) Box-and-whisker plots displaying the time to peak (e) and decay time (f) in neurons and astrocytes. Mann-Whitney test, p<0.01. .
Cortical hyperactivity is independent of mHtt aggregation, astrogliosis or apoptotic cell death in presymptomatic VFDO Hdh150 mice. 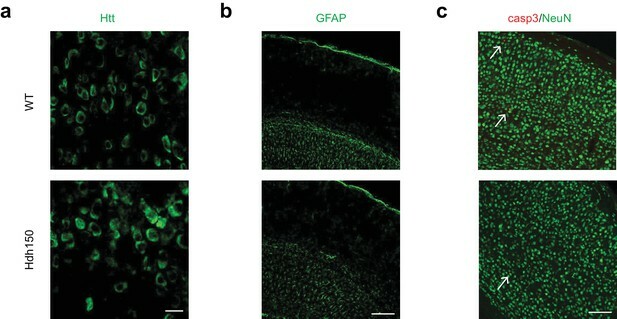 (a, b, c) Confocal images of sagittal or coronal sections of 13 weeks old WT and Hdh150 mice stained for Htt proteins (a), glial fibrillary acidic protein (GFAP, (b)) and neuronal (NeuN, (c)) and apoptotic markers (cleaved-caspase 3, (c), arrows). Scale bars: 20 (a), 200 (b) and 100 (c) µm. Randomization of experimental data to assess specific spatial clustering. (a,b) Color-coded spatial distributions and raster plots of the peak of Ca2+ transients in low (blue), medium (orange) and hyperactive (red) neurons recorded in vivo in layer 2/3 of the visual cortex ((a), left) and after randomization of the data ((b), right). Silent cells are also displayed in the color-coded maps (black). 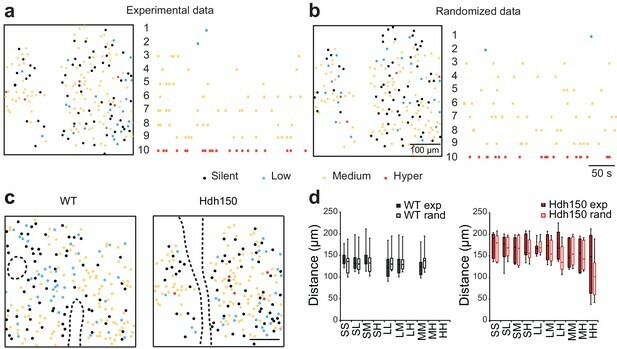 (c) Color-coded spatial distribution of silent (black), low (blue), medium (orange) and hyperactive (red) neurons in WT (left) and Hdh150 (right) mice. The maps are equivalent to Figure 1d, but active neurons were subdivided into groups based on Ca2+ transient frequency. Dashed line outlines the boundary of blood vessels. Scale bar: 100 µm. (d) Box-and-whisker plot showing the mean pairwise distance for the different type of neuronal pairs (SS: silent-silent, SL: silent-low, SM: silent-medium, SH: silent-hyper, LL: low-low, LM: low-medium, LH: low-hyper, MM: medium-medium, MH: medium-hyper, HH: hyper-hyper) in WT (filled dark grey) and Hdh150 (filled red) mice. The experimental data were compared to randomized data (WT rand and Hdh150 rand, open dark grey and red, respectively). No significant difference was observed between groups in WT and Hdh150 mice. This indicated an absence of spatial clustering among any of the subgroups of active neurons. Mann-Whitney test, not significant, see Table 1 for p-values. In vivo two-photon images of mouse visual cortex performed at different depths (indicated in the upper left corner) after multi-bolus loading with OGB-1 AM. Representative time-lapse of in vivo two-photon Ca2+ imaging acquired in layer 2/3 of mouse visual cortex showing single-cell Ca2+ transients. 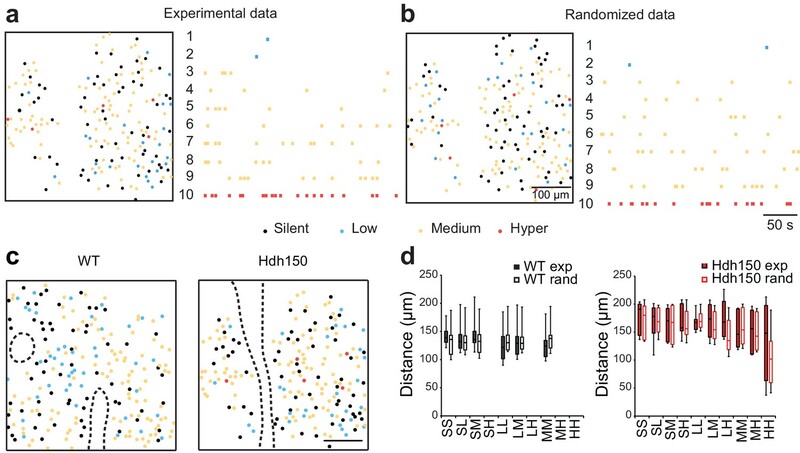 Presymptomatic Hdh150 mice exhibit an increased synchronicity of cortical microcircuits. (a) Color-coded Pearson’s r matrices calculated from representative recordings of WT (left) and Hdh150 (right) mice. Silent cells were excluded from the analysis. Right, color-coded scale of Pearson’s r values. (b) Overall Pearson’s correlation coefficient (Pearson's r) in WT (dark grey) and Hdh150 (red) mice for experimental (filled) and randomized (open) raster data. Mann-Whitney test, WT vs. Hdh150 p<0.05; WT vs. WT rand p<0.0001; Hdh150 vs. Hdh150 rand p<0.0001 (c) Pearson’s r for combinations of neuronal pairs (LL: low-low, LM: low-medium, LH: low-hyper, MM: medium-medium, MH: medium-hyper, HH: hyper-hyper) in WT (dark grey) and Hdh150 (red) mice. * pairwise comparisons between a pair of WT and Hdh150 mice. # comparisons of functional subgroup pairs to the low-low pair within the same genotype. The pairs involving hyperactive neurons could only be analyzed in Hdh150 mice. Mann-Whitney test, WT vs. Hdh150 mice: MM p<0.05 in Hdh150 mice; compared to LL: MM p<0.05, MH p<0.01, HH p<0.01 (d,e) Relationship between Pearson’s r and distance between neuronal pairs in WT (black) and Hdh150 (red) mice (d) and randomized data (e). Lines represent the linear fit of WT and Hdh150 experimental data. Two-way ANOVA (d) Genotype: p<0.0001 Distance: p=0.97, Interaction: p=0.3, (e) Genotype = 0.35, p=0.3, Interaction: p=0.8. Numerical values of Figure 2 and associated supplement figures. Randomization of experimental data to assess specific network synchronicity. (a,b) Comparison of Pearson’s r for different functional subgroup pairs in WT experimental and randomized data (a) and Hdh150 data (b), *p<0.05, **p<0.01 and ***p<0.001, Mann-Whitney test. #p<0.05, ##p<0.01, in comparisons of functional subgroup pairs to the low-low pair within the same genotype. 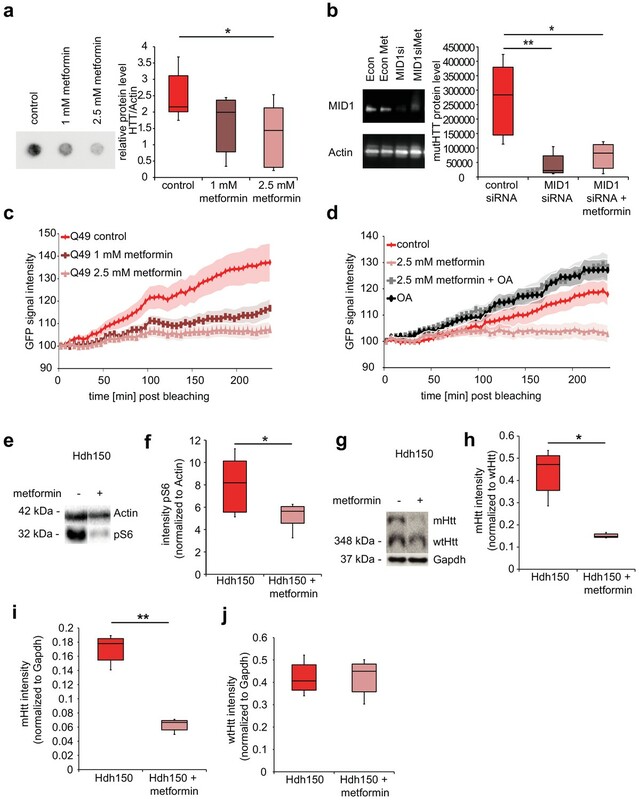 Presymptomatic Hdh150 mice did not exhibit alteration of mitochondria respiration. (a,b) Scheme of the Oroboros O2K respirometer and typical traces obtained from high-resolution respirometry of microdissected cortical tissue from male WT or Hdh150 mice. (c) Box-and-whisker plot depicting the O2 flow in n = 6 mice per genotype. No difference was observed indicating that mitochondria respiration is similar in the two genotypes. Mann-Whitney test, not significant, see Table 1 for p-values. 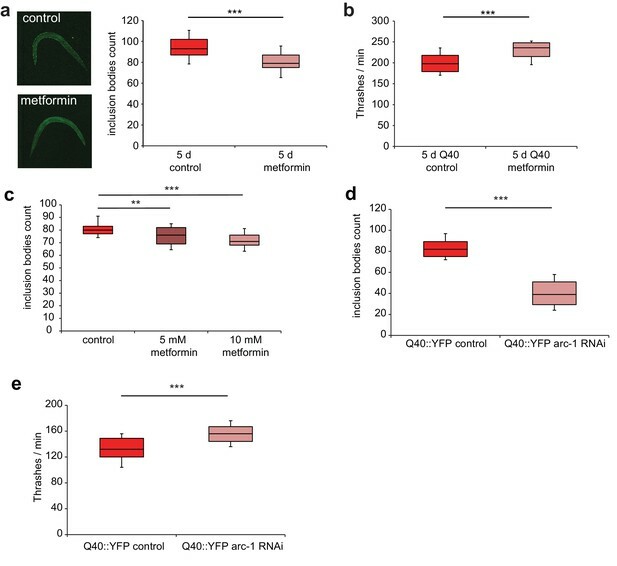 Presymptomatic VFDO Hdh150 mice exhibit anxiolytic behavior. (a) Representative travel pathways of WT (left) and presymptomatic Hdh150 (right) mice analyzed in a 5 min open field test. (b) Increased explorative behavior of Hdh150 animals compared to the WT mice. Mann-Whitney test, p<0.05. Numerical values of Figure 3 and associated supplement figures. Presymptomatic VFDO Hdh150 mice did not exhibit deficit in visual discrimination test and explorative behavior in novel object recognition test. (a) Schema of the visual discrimination task set-up. Left, front view of the touch screen panel. Right, top view of the complete test set-up. A monitor is placed at the end of the unit which simultaneously displays the correct and false choice. 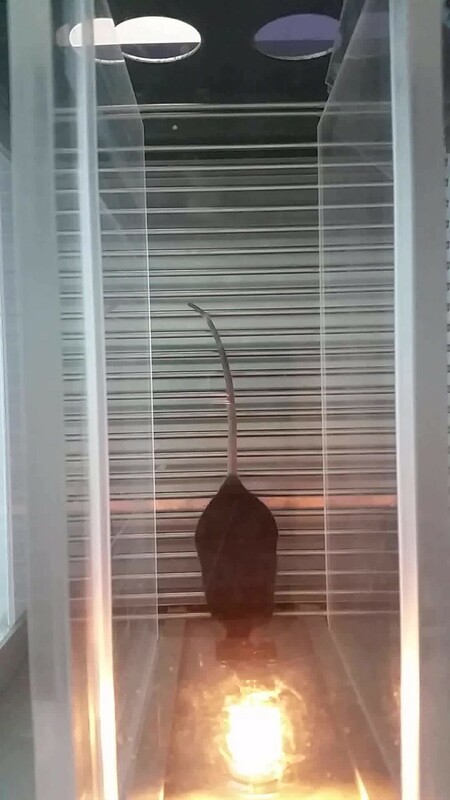 Both WT and presymptomatic VFDO Hdh150 mice were trained to choose the correct screen and for each correct choice made, a food pellet was released from a reward dispenser placed on the other end of the unit. (b) Graph representing time course of the training sessions of WT (dark grey) and presymptomatic Hdh150 (red) mice. Training sessions were carried out for both groups; mice that made at least 70% correct choice for 3 consecutive days were considered for discrimination analysis. After a training period of 7 days, mice were able to perform tasks successfully reaching the 70% criterion (dashed line). 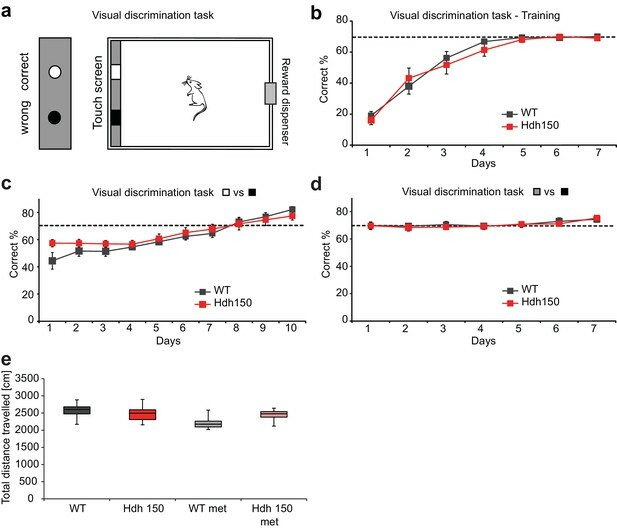 Note that no significant difference was observed between WT and Hdh150 mice during the training of visual discrimination task. Repeated measures two-way ANOVA, genotype p=0.6; time p<0.0001; interaction p=0.6. (c,d) Time course of visual performance in WT (dark grey) and Hdh150 (red) mice during visual discrimination first of black and white screens (c) and then of black and grey screens (d). c: Repeated measures two-way ANOVA, genotype p=0.5; time p<0.0001; interaction p=0.03. d: Repeated measures two-way ANOVA, genotype p=0.8; time p<0.01; interaction p=0.9. (e) 9-week-old transgenic Hdh150 mice and wildtype littermates received metformin containing (5 mg/ml, met) or pure water over a period of 3 weeks. Groups of WT, Hdh150, WT met and Hdh150 met were analyzed in an open-field test and total distance travelled was measured. Mann-Whitney test, p=0.3. Example of visual discrimination task performed by a trained mouse, real time. Metformin reduces translation rates of mutant HTT through MID1/PP2A protein complex in vitro and decreases both S6 phosphorylation and mutant Htt protein load in Hdh150 animals. (a) FLAG-HTT detected on a filter retardation assay after treatment with and without 1 mM and 2.5 mM metformin. Quantification on right panel. Mann-Whitney test, control vs. 1 mM metformin p=0.08; control vs. 2.5 mM metformin, p<0.05. (b) Stable cell line expressing FLAG-HTT exon1 with 83 CAG repeats transfected with MID1-specific siRNAs or control siRNAs in the presence or absence of 2.5 mM metformin. FLAG-HTT detected on a filter retardation assay. Efficiency of the knock-down including Actin as a loading control is shown on a western blot (left panel). Quantification of filter retardation assay on right panel. Mann-Whitney test, control siRNA vs. MID1 siRNA p<0.01; control siRNA vs. MID1 siRNA + metformin p<0.05. (c) Protein translation rate of GFP-tagged mutant Htt exon1 (49 CAG repeats) in primary cortical neurons measured in a FRAP-based assay, over a time frame of 4 hr. Lines show the GFP-signal intensity over time in mock-treated (control) and metformin-treated (1 mM and 2.5 mM) cells. Lines represent means, shadowed areas standard deviations. Repeated measures two-way ANOVA, treatment p<0.01, time p<0.0001; interaction p<0.0001. (d) Protein translation rate measured in a FRAP-based assay (see c). Lines show the GFP-signal intensity over time in mock-treated (control), metformin-treated (2.5 mM), ocadaic acid (OA)-treated and metformin +OA-treated cells. Shadowed areas show SEM. Repeated measures two-way ANOVA, treatment p<0.01, time p<0.0001, interaction p<0.0001. 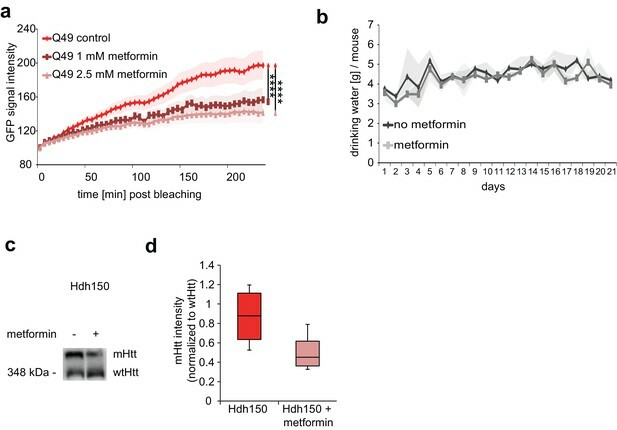 (e) Transgenic Hdh150 mice received metformin-containing water (5 mg/ml, Hdh150 +metformin) or pure water (Hdh150) over a period of 3 weeks. Whole brain lysates were analyzed for the phosphorylation of S6, the expression of total S6, mHtt and wtHtt on western blots. Representative western blots are shown. (f) Quantification of pS6 relative to S6. Unpaired t-test, p<0.05. (g) mHtt and wt Htt proteins of prefrontal cortex lysates analyzed on western blots after 11 weeks of treatment with metformin (5 mg/ml, Hdh150 +metformin) or pure water (Hdh150). Representative western blots are shown. (h) Quantification of mHtt relative to wtHtt. Treatment of 5 mg/ml metformin in the drinking water showed a significant reduction of mHtt protein compared to water control treatment. Unpaired t-test p <<0.05 (i) Quantification of mHtt relative to Gapdh. Unpaired t-test, p<0.01. (j) Quantification of wtHtt relative to Gapdh. Unpaired t-test, p=0.88. Numerical values of Figure 4 and associated supplement figures. 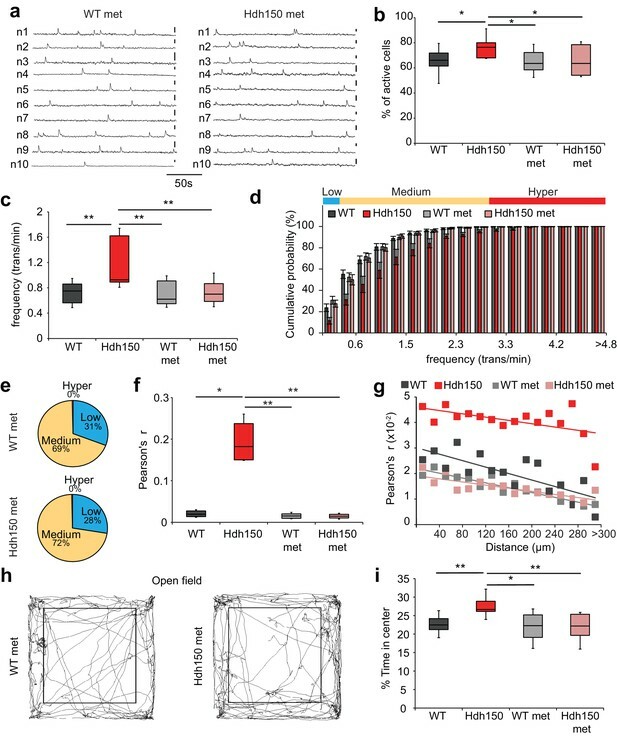 Metformin reduces mutant Htt protein translation and does not change drinking behavior of Hdh150CAG animals. (a) GFP-tagged mutant (49 CAG repeats- Q49) Htt exon1 was expressed in N2A cells and protein translation rate were measured in a FRAP-based assay, in which the GFP signal of transfected cells is removed by photobleaching and the synthesis rate of freshly translated GFP-tagged protein is measured over a time frame of 4 hr. Lines show the GFP-signal intensity over time in mock-treated (control) and metformin (1 mM and 2.5 mM) treated cells. Shadowed areas show standard deviations. Repeated measures two-way ANOVA, treatment p=0.03; time p<0.0001; interaction p<0.0001. (b) Male, 9-week-old Hdh150CAG animals were fed with 5 mg/ml metformin in the drinking water (metformin) or with pure water (no metformin) and observed over 21 days. The water consumption was monitored every day. Lines represent means, shadowed areas show ±SEM. Repeated measures two-way ANOVA, treatment p=0.3; time p=0.06; interaction p=1. (c) Transgenic Hdh150 mice received metformin-containing water (5 mg/ml, Hdh150 +metformin) or pure water (Hdh150) over a period of 3 weeks. Whole brain lysates were analyzed for the expression of mHtt and wtHtt on western blots. Representative western blots are shown. (d) Quantification of mHtt relative to wtHtt. Unpaired t-test, p=0.18. Metformin treatment rescues motility impairment in a C.elegans model. (a) Q40::YFP nematodes were treated with 500 mM of metformin or pure water (control): Images of nematodes with and without metformin treatment for 5 days (left panel): After 5 days of metformin treatment, the number of aggregates was significantly reduced (right panel): Mann-Whitney test, p<0.0001. (c) Q40::YFP worms were grown on heat-inactivated bacteria on plates pre-treated with either 5 mM or 10 mM of metformin or with pure water (control). After 5 days of metformin treatment, the number of inclusion bodies was analyzed. Mann-Whitney test, control vs 5 mM metformin, p=0.008; control vs 10 mM metformin, p<0.0001. (d,e) RNAi knockdown of the MID1-ortholog arc-1 was performed in Q40::YFP C. elegans. After 5 days, the number of inclusion bodies (d) and liquid thrashing events (e) were analyzed. Mann-Whitney test, p<0.0001. 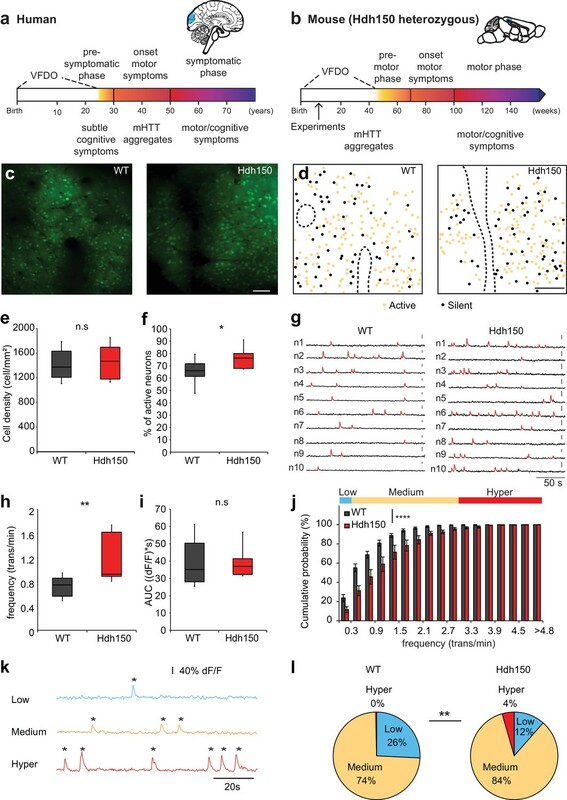 Metformin treatment reverses pathological neuronal network activity and behavioral abnormalities in presymptomatic VFDO Hdh150 mice. (a) Representative traces of spontaneous Ca2+ transients of 10 neurons recorded in vivo in WT and Hdh150 mice after metformin treatment. Vertical scale bar: 40% dF/F. (b) Relative proportion of spontaneously active neurons in WT (dark grey), Hdh150 (red), WT metformin-treated (light grey) and Hdh150 metformin-treated (light red) mice. Mann-Whitney test, WT vs. Hdh150, p<0.05; Hdh150 vs. Hdh150 met, p<0.05; Hdh150 vs. WT met, p<0.05. (c) Significant reduction in the spontaneous Ca2+ transient frequency to WT levels in Hdh150 mice after metformin treatment (red vs. light red). Mann-Whitney test, WT vs. Hdh150, p<0.01; Hdh150 vs. Hdh150 met, p<0.01; Hdh150 vs. WT met, p<0.01. (d) Cumulative frequency distributions of Ca2+ transients in WT (dark grey), Hdh150 (red), metformin-treated WT (light grey) and metformin-treated Hdh150 (light red) mice. Top, color-coding of active neurons by frequency. Two-way ANOVA test, Group: p<0.0001; Time: p<0.0001; Interaction: p<0.0001. (e) Pie charts showing the relative proportion of low (blue), medium (orange) and hyperactive (red) neurons in layer 2/3 of the visual cortex in WT (top) and Hdh150 (bottom) mice after metformin treatment. Chi-square test, p=0.62, Chi-square = 0.24. (f) Comparison of Pearson’s r between a pair of neurons in WT (dark grey), Hdh150 (red), metformin-treated WT (light grey) and metformin-treated Hdh150 (light red) mice. Mann-Whitney test, WT vs. Hdh150, p<0.05, Hdh150 vs. Hdh150 met, p<0.01, Hdh150 vs. WT met, p<0.01. (g) Relationship between pairwise Pearson’s r and pairwise distance in metformin-treated WT (light grey) and Hdh150 (light red) mice. Two-way ANOVA test, group p<0.0001; Distance p=0.09; Interaction p<0.001. (h) Representative travel pathways of a metformin-treated WT (left) and pre-symptomatic Hdh150 (right) mice analyzed in a 5 min open-field test. (i) Decrease in the explorative behavior of metformin-treated Hdh150 animals. Mann-Whitney test, WT vs. Hdh150, p<0.01; Hdh150 vs. Hdh150 met, p<0.001; Hdh150 vs. WT met, p<0.05; WT vs. Hdh150 met, p=0.8. Numerical values of Figure 5 and associated supplement figures. (a) Two-photon images of OGB-1 AM staining collected in vivo at different depths (from 150 to 270 µm from pial surface) in the visual cortex of WT and Hdh150 mice after metformin treatment. Scale bar: 70 µm. (b) Quantification of the density of stained cells in layer 2/3 of the visual cortex in WT (black), Hdh150 (red, n = 10 animals), metformin-treated WT (light grey) and metformin-treated Hdh150 (light red) mice. No significant difference was found in the cell density across genotypes. Unpaired t-test, p=0.7. (c) Area under the curve (AUC) of Ca2+ transients in WT (black), Hdh150 (red), metformin-treated WT (light grey) and metformin-treated Hdh150 (light red) mice. Unpaired t-test, WT vs. WT met, p<0.05. (d) Box-and-whisker plot showing Pearson’s r between different combinations of neuron pairs (LL: low-low, LM: low-medium, LH: low-hyper, MM: medium-medium, MH: medium-hyper, HH: hyper-hyper) in metformin-treated WT (light grey) and metformin-treated Hdh150 (light red) mice. There was no statistical difference between WT and Hdh150 mice after metformin treatment. # a statistical difference between a pair vs. LL within the same genotype. Unpaired t-test, WT met: LL vs. LM, p<0.05; LL vs. MM, p<0.0001; Hdh150 met: LL vs. MM, p<0.01. (e) Comparison of Pearson’s r between different combinations of neuron pairs in WT (dark grey), Hdh150 (red), metformin-treated WT (light grey) and metformin-treated Hdh150 (light red) mice. * a statistical difference between WT within the same functional subgroup. LM WT vs LM Hdh150 and MM WT vs MM Hdh150 p<0.05. (f) Pairwise distance for the different neuronal pairs (SS: silent-silent, SL: silent-low, SM: silent-medium, SH: silent-hyper, LL: low-low, LM: low-medium, LH: low-hyper, MM: medium-medium, MH: medium-hyper, HH: hyper-hyper) in metformin-treated WT (light grey) and metformin-treated Hdh150 (light red) mice. No significant difference between metformin-treated WT and metformin-treated Hdh150 mice could be found. Mann-Whitney test, not significant, see Table 1 for p-values. n = 11, 2.5 mM metformin n = 10. Figure 4b Mann-Whitney test control siRNA vs MID1 siRNA p=0.008, control siRNA vs MID1 siRNA + metformin p=0.015 Control siRNA n = 6, MID1 siRNAn = 6, MID1 siRNA + metformin n=6. Figure 1—figure supplement 3d Mann-Whitney test In WT mice: SS vs SL p=0.5, SS vs SM p=0.9, SS vs LL p=0.1, SS vs LM p=0.2, SS vs MM p=0.1, SL vs SM p=0.4, SM vs LL p=0.1, SM vs MM p=0.1, LL vs MM p=0.9, LM vs MM p=0.4, LM vs SM, p=0.2. In WT vs WT rand: WT mice: SS p=0.5, SL p=0.7, SM p=0.3, LL p=0.3, LM p=0.8, MM p=0.1. algorithm EthoVision XT 8.5 Noldus RRID:SCR_000441 https://www. Values used in figures are available on Dryad Digital repository (doi:10.5061/dryad.g3b5272). The code used for the analysis of calcium imaging is attached as a source file. The numerical values for each figure are enclosed as source data files.